"A classic risk and reward hole. 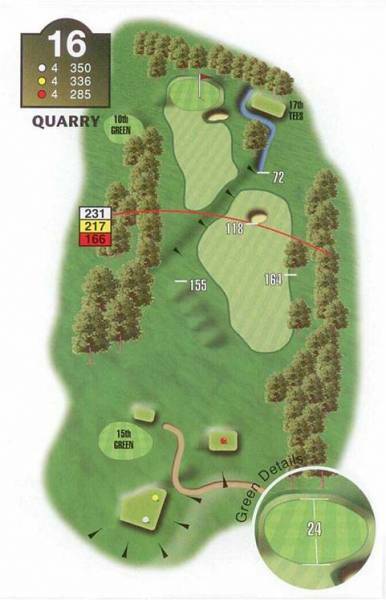 For the long hitter the green is in range as it swings left around six large trees - however, a less than perfect shot will bound off the natural slope towards a snaking water hazard. Keeping the ball on the fairway is essential if you are going to challenge the hole. A fairway bunker sits in wait for the misjudged lay up, ready to inflict heartache onto any unsuspecting player. "The green sits at the bottom of a slope, allowing the patient player to manoeuvre the ball down the incline and onto the putting surface. Here you will confront some devious slopes and contours as you get close to the finish line."